Happy Wednesday!! My newest obsession as of late is ruffles. 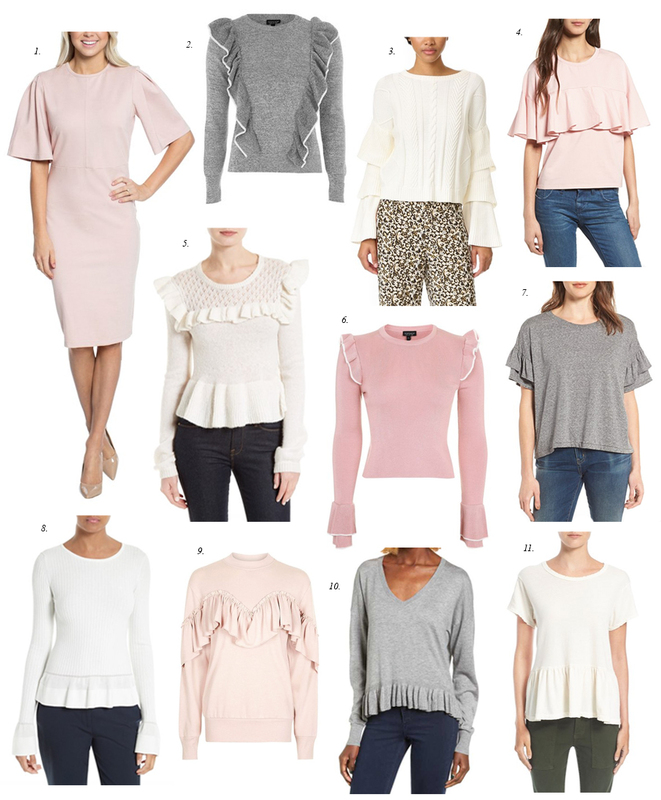 I wore my newest ruffle sweater (#5) on my birthday earlier this week in this post, and I still love this one I wore a few weeks ago in this post. There’s just something about the feminine, fluttery detail that I can’t get enough of!!! What do you guys think of the trend?! I love ruffles! I think they can make an outfit look and feel so feminine and simple. I LOVED that pretty white Rebecca Taylor ruffle sweater you were wearing in all of your insta birthday photos, Rachel!! So cute! Happy (belated) Birthday, by the way! Thank you, Kelsey! You are so sweet! Nice items. Love this style. I love these picks! Ruffles are so cute! http://trendkeeper.me .. Treat yo self with a spa night! Love the ruffle trend! Purchased #4! Love all the pink choices! I love the trend as well, Rach! It’s so feminine and flirty and adds such great detail to an outfit. I love the dress from your collection, as well as 2, 3, and 6! Thanks for sharing and I hope you’re having a great week so far! Ruffles have always been a part of my style and I’m so glad they’re staying on trend in 2017! I love #5. I might just have to scoop that up myself. I’m obsessed with ruffles, So I’m glad it’s back on trend! I love this trend! And I really love that it’s on knitwear now as well! So do I! I was getting a little bored of simple sweaters! So many cute options! I’m completely obsessing over ruffles right now too! I love the ruffle trend as well! I have bought several tops lately that have ruffles either at the wrists, shoulders or chest. Ruffles are so feminine and girly. I love #s 2, 5, and 6. I have also noticed a trend with secretary blouses (tops having a tie or a bow). Loving that trend, tool! Have a great day! So glad you agree! It really adds so much to an outfit, but it so easy! Love your pics! Thanks for following along! I love the fifth top! You can literally never have too many ruffles! Such cute picks, Rach! I love the look but I always feel like ruffles add bulk and make you look bigger/wider unless you are very slim. I like options 1, 8, 10, and 11 because the ruffle is minimal and wont add bulk to my frame. I can totally see what you’re saying, I feel that way about some ruffles as well. However the vertical ruffles seem to be so slimming! Glad you found some you love! Thanks for following along!